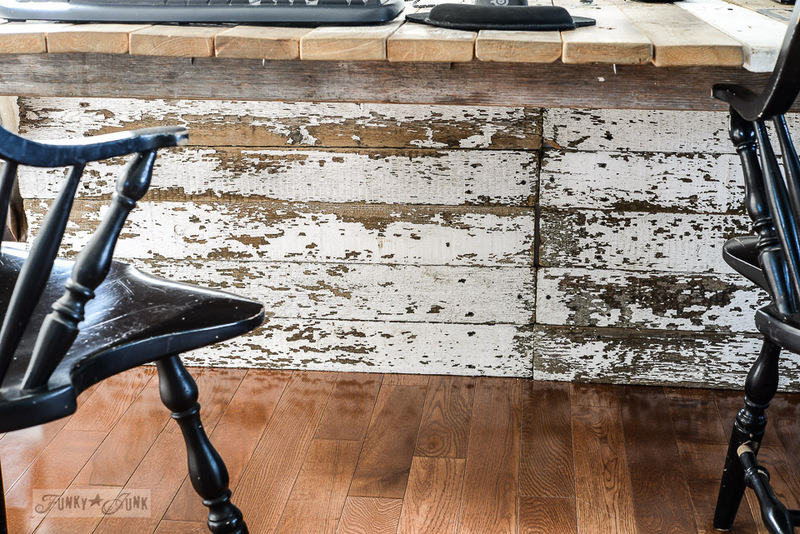 A cleaner, whiter reclaimed wood office reveal is finally a wrap! Can YOU see what’s different? 🙂 Sooo many things. To recap, my self proposed challenge was to clean up, and lighten up this area. My home resembles a cave when the sun doesn’t shine, so I wanted the back wall white and bright, to hopefully retain more lightness during our dark, dreary winters. 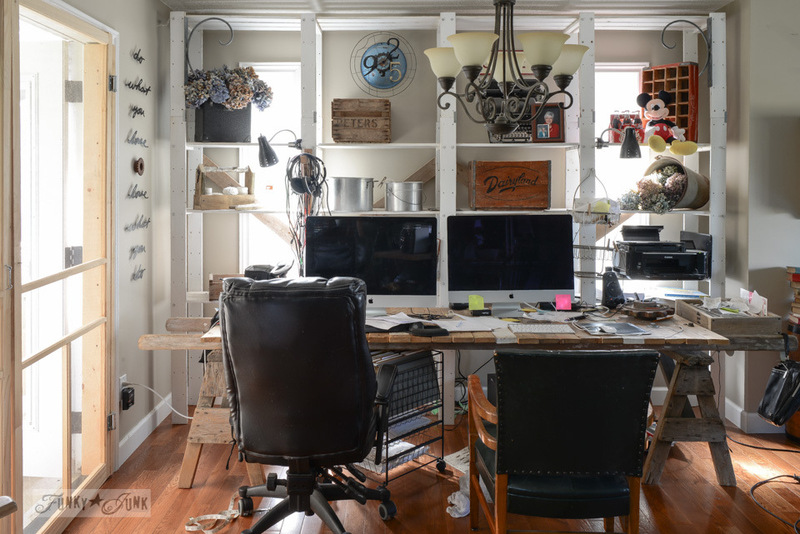 The before and backstory for this office is HERE. But in a nutshell, I meant to only clean, but got carried away and decided to paint too. What a stall, which I’ll talk about soon. Not sure I will go this route from hereon out. I think I’ll just clean first, then go back and refresh some areas once it’s been dejunkified. So beware… doing it right just takes a LOT longer. The wall adjacent to the white feature wall was also lightened up, which I plan to carry throughout the rest of the house. It’s a fresher version of what was already there. Same colour, but much lighter intensity. One other elephant in the room was the overhead light. While it served its place well when we use to have a kitchen table in this space, we were always seeing stars after bonking our heads against it on nearly a daily basis! So I got the nerve to flick off the power, and clip off those wires. Done! This move alone made the room feel SO much bigger. For now, until I can make my own junk light, this ‘Antiques sign’ is covering the annoyingly off centre hole. 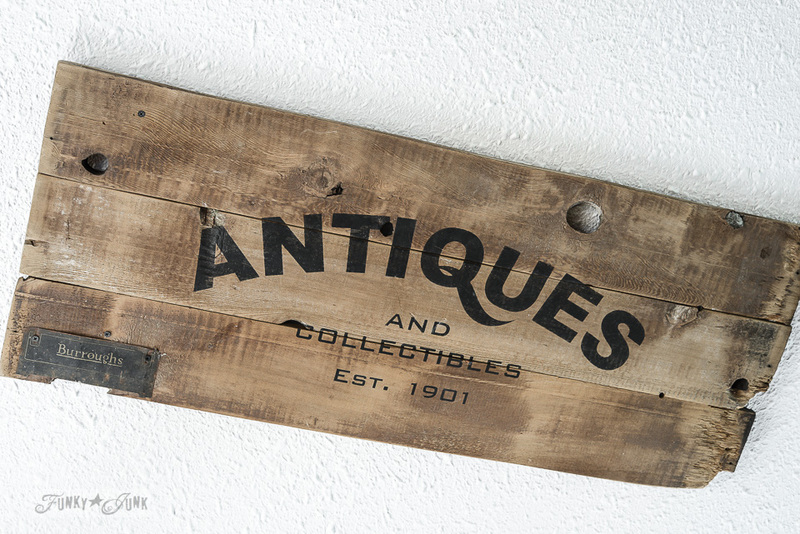 Antiques sign tutorial is HERE. 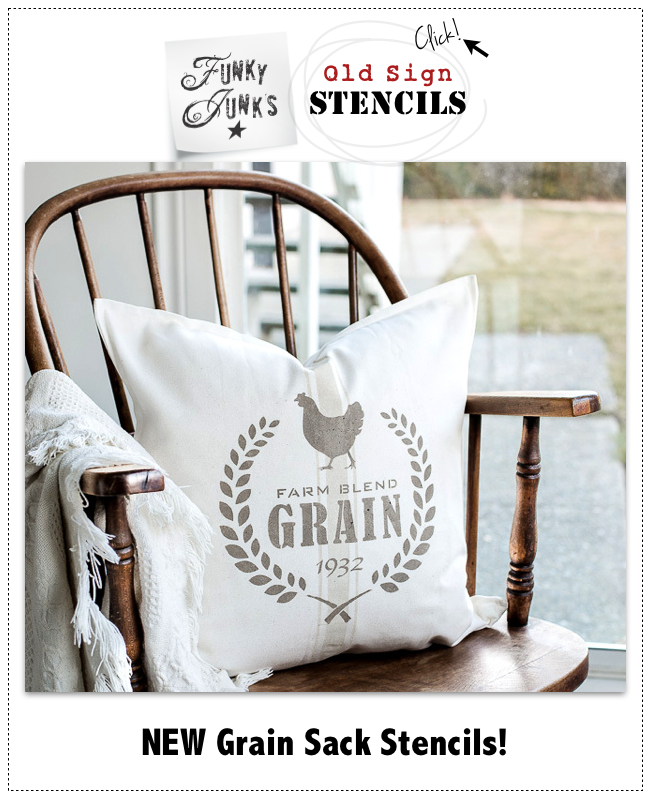 You can purchase the ANTIQUES stencil from HERE. Another somewhat unusual perk are these reclaimed fence boards. They were directly attached to the wall unit front to hide all the computer wires. YES!!! Every other one was screwed into place, so it’s easy to remove a board for access when desired. 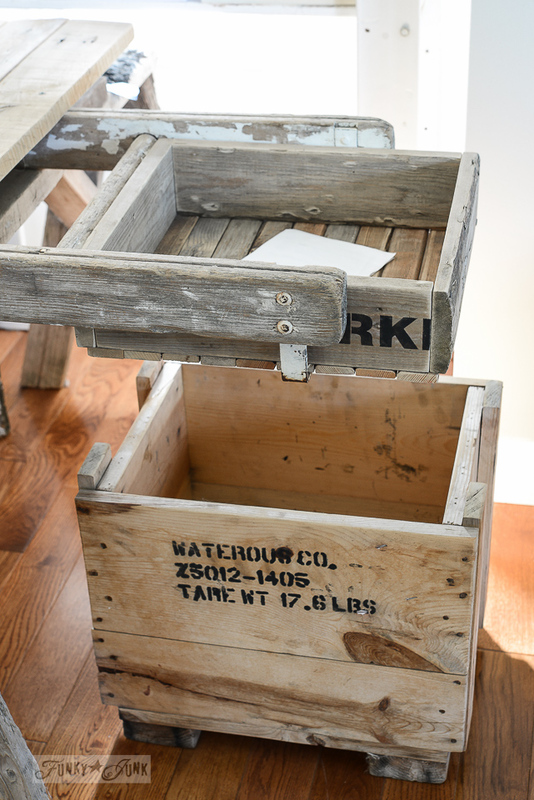 These crate paperwork storage ideas suit this rustic office to a T! I’ll be making a rolling cart version for under the desk for hanging monthly files as well. Yay, a new challenge! 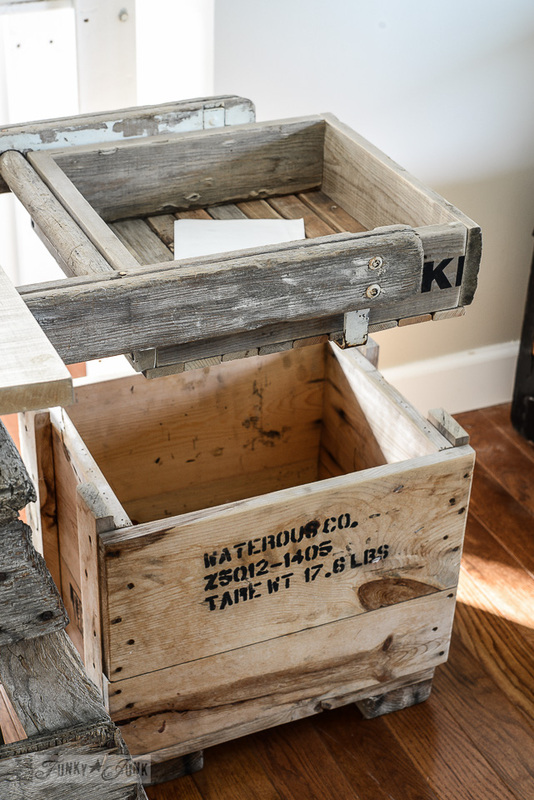 How to make your own crate is HERE. Everyone needs help with staying on task, and I do that with charts, checking off what I need to accomplish each day. 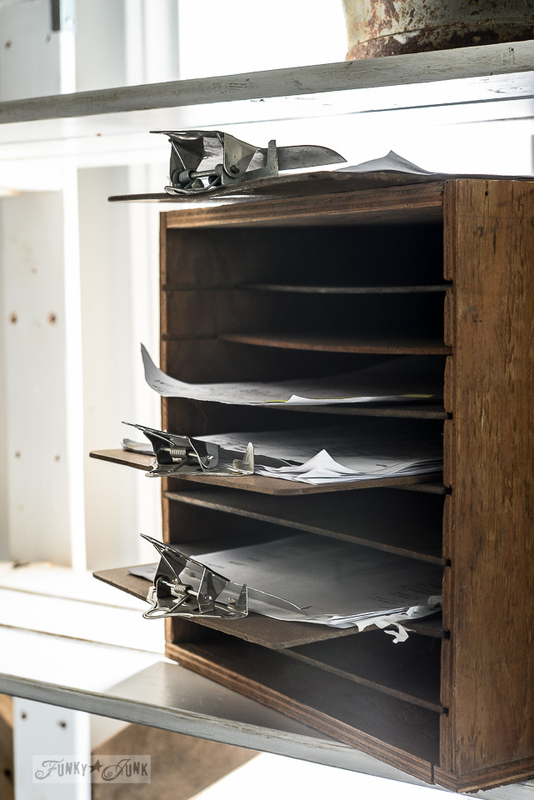 Each sheet is on its own clipboard, so it’s easy to access, without cumbersome books nor paper pad / sheets that go missing. This wooden file was found on one of my junk trips to Hope! This office area is about WAY more than pretty. Each container was carefully selected to hold stuff. This antique pot holds camera wires, caps, etc. Another holds spare batteries and their chargers. 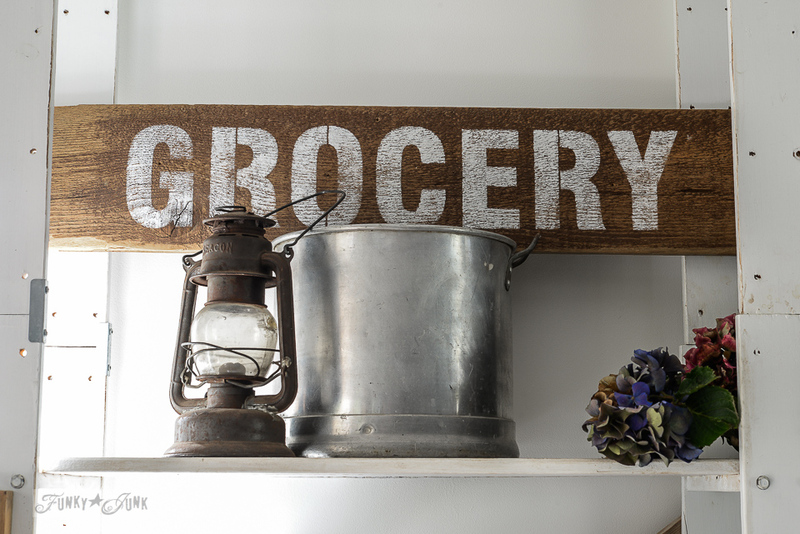 You can find the GROCERY stencil HERE. But I think this is temporary… I can see a junk light made from these guys coming soon! All three are PERFECT For what I have in mind. 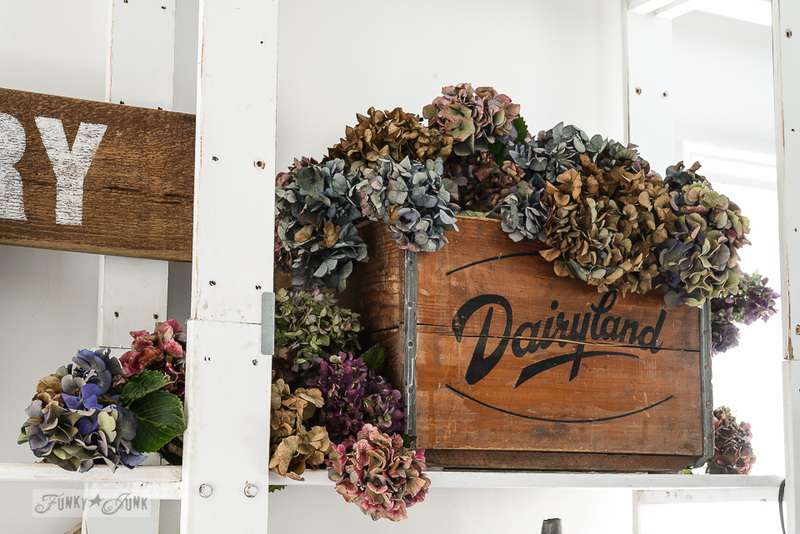 Remember my post about my secret to staging and drying hydrangeas? Here’s the finished result. 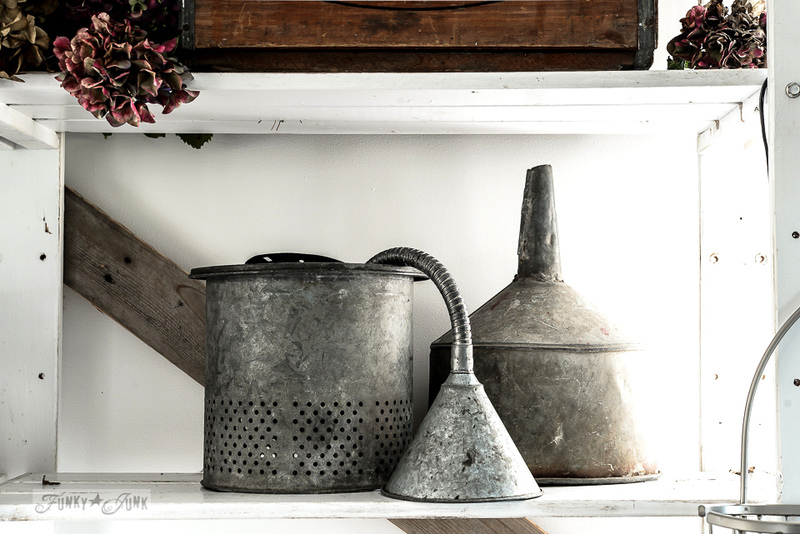 Storage made pretty and intentionally artful, everywhere you look. I also tried to keep things from blocking the sunlight as much as possible. Those windows are invaluable! I’m so very happy with this much lighter and brighter desk area, and am so glad I can now move on to other areas! See you next Wednesday with another revamp! Wish to join the challenge? Here’s two ways! 1. 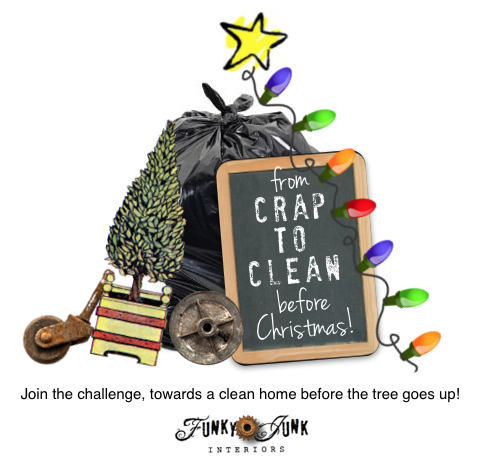 Click to join Crap to Clean on Facebook HERE, a private group for ongoing encouragement. 2. 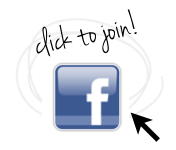 Visit here each Wednesday, and link up your progress below if you have it online. Visit other Crap to Clean instalments HERE. How did you make out this past week? Wow! What was once an amazing place just got more amazing! I love the white and bright look of everything with the old wood. Your stencils are amazing. I had the same problem with the overhead light in my old dining space so I switched it out for a flush mounted schoolhouse light and it was the perfect fix. 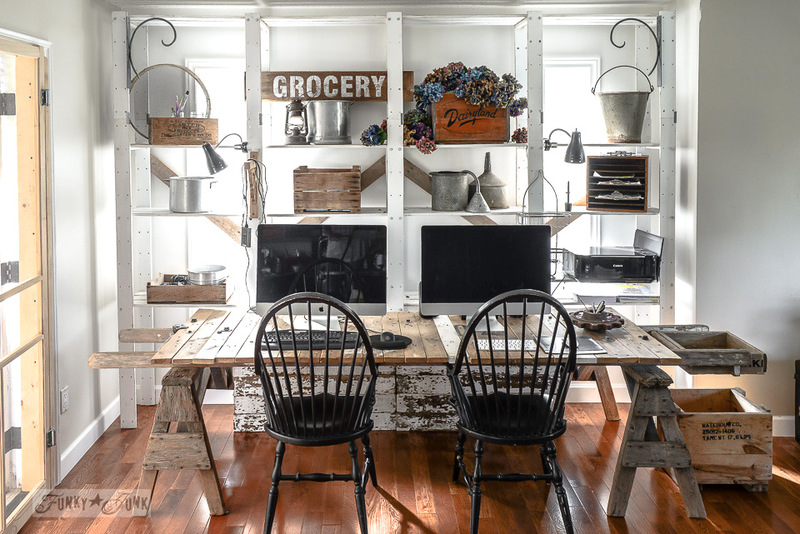 Love the room, love the shelves and all the great DIY storage Donna! Donna, this looks wonderful. I love the white with the natural wood. Looks great! I love that you took the light fixture down. It really did open up the space! Looks amazing Donna. I’m looking at my office and all I want to do is run the other way! Where do you put all your office stuff, paperwork? Well done! I know what you mean about the chandelier. I insisted on having a beautiful stained glass one in my garage above my work bench, but keep bonking into it with my head as well. Not sure what to do because I also love looking at it but there just isn’t any space there. Oh my gosh! 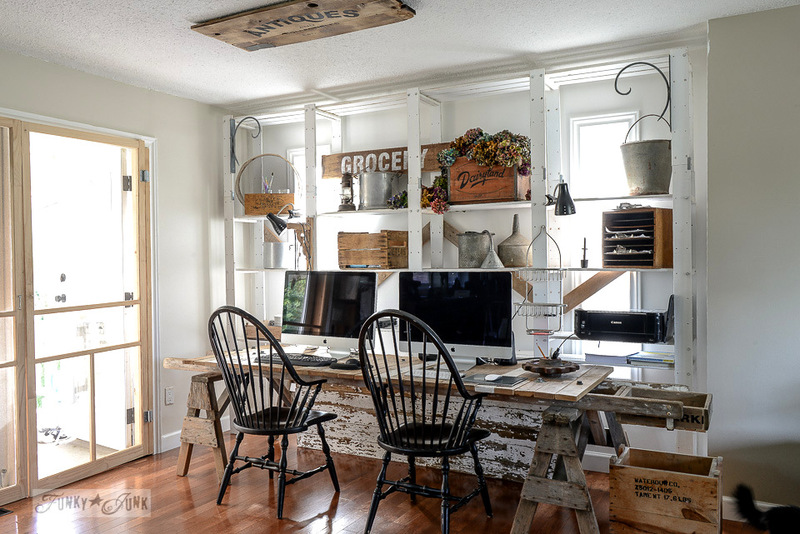 I absolutely love the white chippy wood to cover the cords!!! Great idea! Any project that includes “white chippy” makes my day!!! The whole room just shines! Great job!!! It looks really lovely! I built a table similar to yours for my studio and have just loved it. I really like the panel you built to hide the cords! Thanks for sharing. The room looks fantastic! My favorite part? The sign on the ceiling! Brilliant. Don’t change it….it’s too YOU! It was totally worth the effort you would have had to have made to get it done. Either I haven’t noticed before, or it’s on a post from before I started following you . 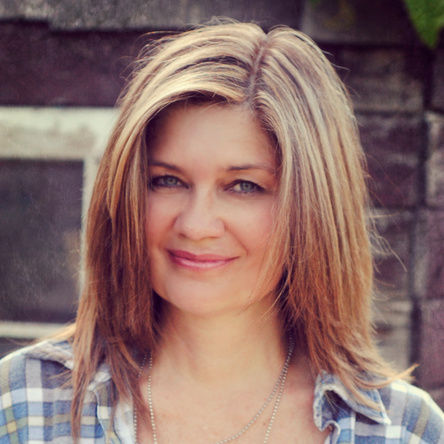 . . did you make the screen doors to the left of your desk? It looks like there was a “builder” exterior door and then an unstained screen door on the inside? It looks sturdy and awesome! If you can revisit the post where you made it, I’d love to see it. Hi Melanie! The screen doors were purchased for cheap, but I figured out a way to install them… cheap. haha They work fantastic! Cheapest fix ever. Thank you! I love screen doors — too many bugs on the prairies to go without. 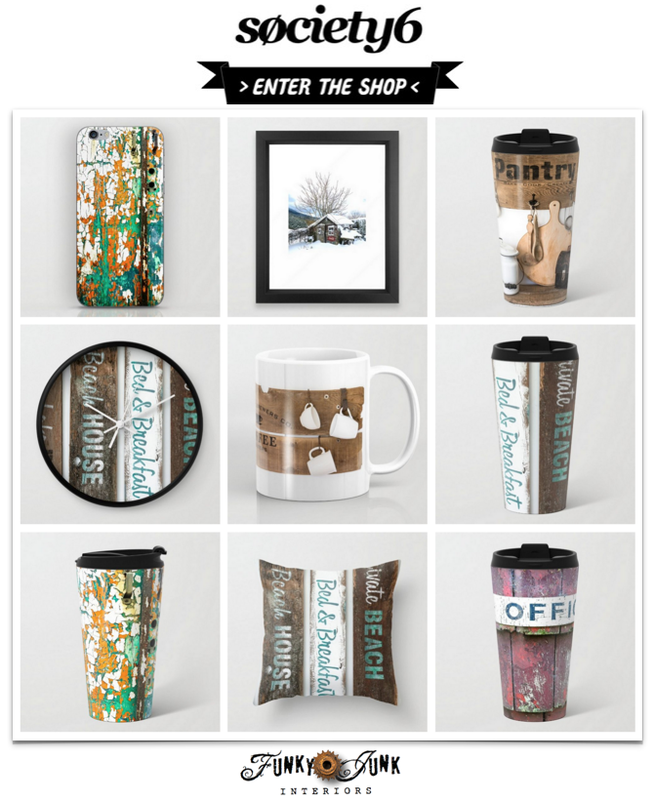 So many storage ideas that don’t look like storage at all, how do you do that?? One of my biggest pet peeves is when wires and cords are visible (and a tangly mess, to boot). 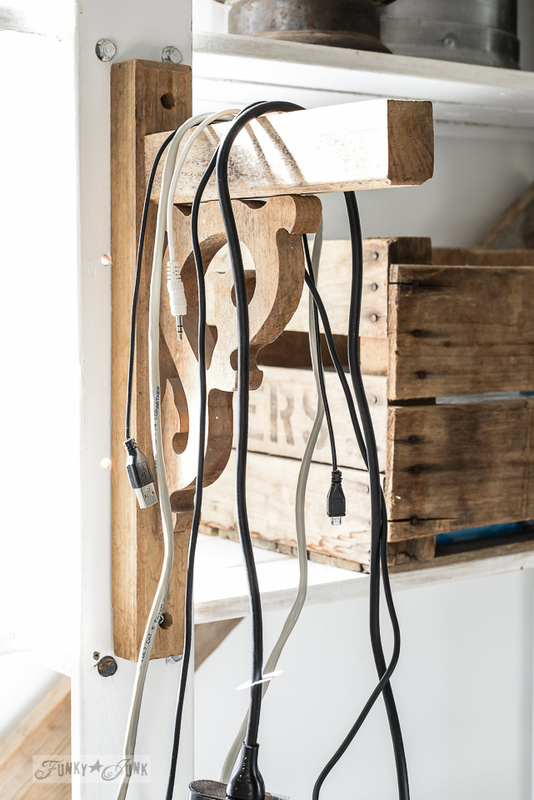 Your chippy white fence pieces not only look cool, but work magic for hiding those cords. Looking forward to how your new lighting is going to turn out. 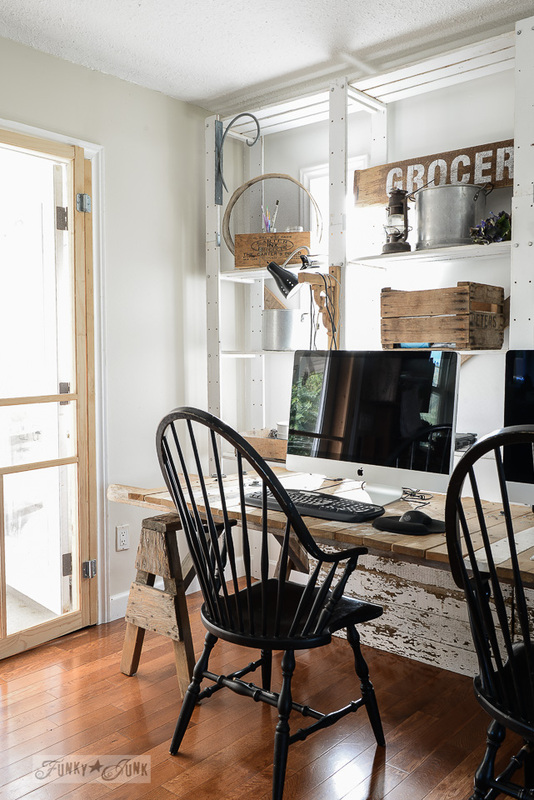 Catching up on your posts & had to tell you…you made my day with the screen door idea for french doors so thanks for the link to your former post. My french doors are in a walk-out basement to my lawn area and I can’t tell you how many ideas I’ve tried for screen doors. Best is I already have two wooden screen doors I’ve saved for yrs. & now they will be in use rather than in storage. My kitties say thank you too! 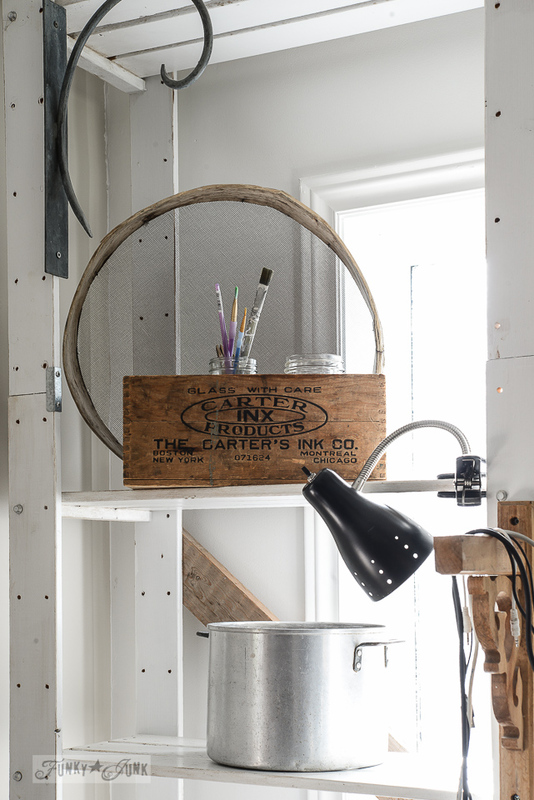 Love your brighter office area and especially all the old containers, which I have lots of too, for storage.